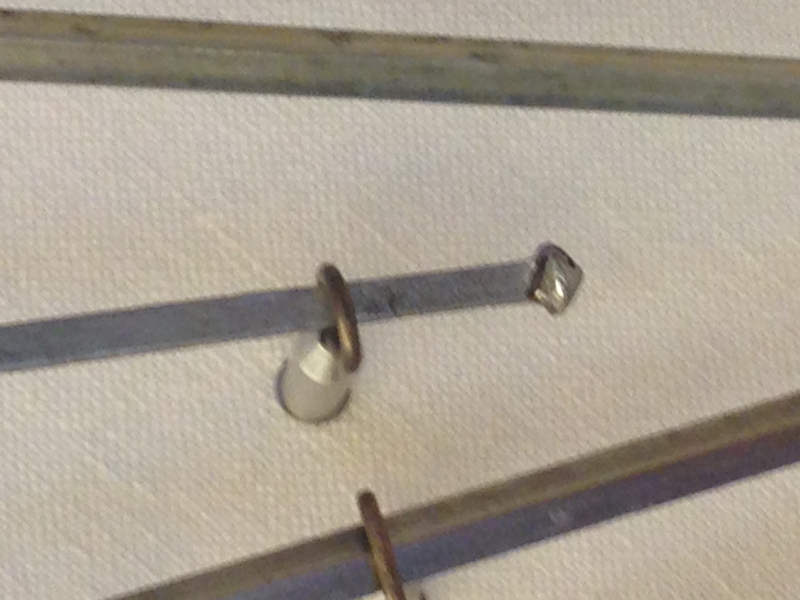 In Figures 1 through 5, you can see three versions of the practice rapier/spada da marra/fioretto. The blades on each have a rectangular cross section and nail head, mounted with a swept-hilt. Typically the nail-head of the blade was affixed with a protective covering, made out of leather, about the size of a musket ball, and often up to the size of a tennis ball. 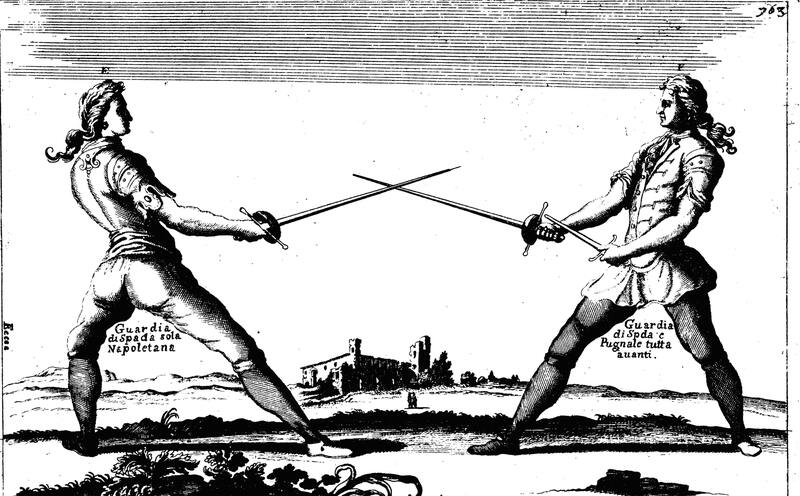 In the image in Figure 5, one can see a practice rapier as well as a practice dagger from this period. The Victoria and Albert Museum shows these in conjunction with an actual weapon so the viewer can get a better idea of the length and size of both the actual weapon and the practice weapon. 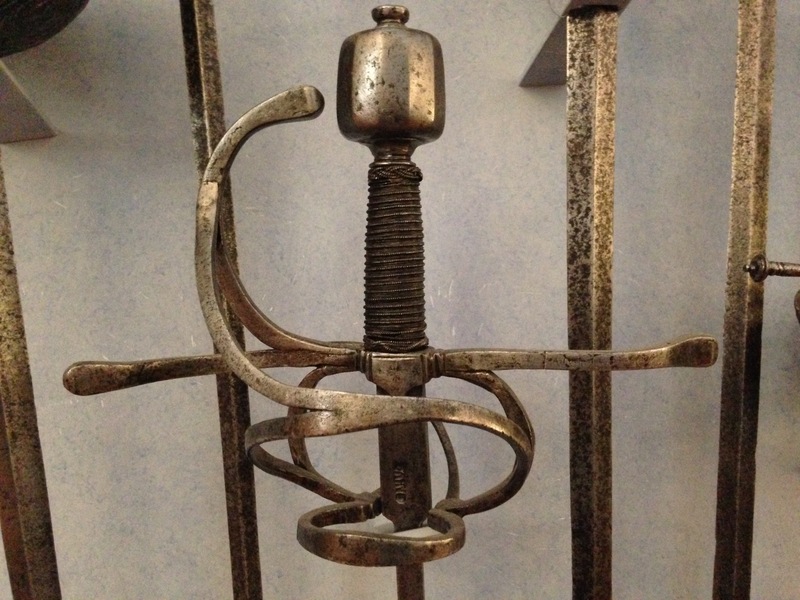 Although the swept hilt is typical of the actual rapier of the period (the first half of the seventeenth century), the cup-hilt (based upon the Spanish cup-hilt rapier) became the standard hilt design for both the spada da marra/fioretto and the actual pointed and edged rapier. When this cup-hilt design became universally accepted in the Italian schools, and by Italian swordsmen, we cannot pinpoint with exactitude. Francesco Antonio Marcelli, in his 1686 treatise, Regole della Scherma , mentions the smarra di lettione and the fioretto, using these terms synonymously. In the index he mentions the smarra di lettione, while in the text itself he only uses the term fioretto in reference to the heavy practice sword, typically used by fencers to develop strength in the hand and arm. While there are many illustrations of French foils in the French texts in the second half of the 17th century, there is a lack of clear evidence from the Italian texts of the same period. Even when foils with cup-hilts are illustrated, as in Morsicato Pallavicini’s treatise of 1670, La Scherma Illustrata (see Figure 6), it is difficult to draw any definite conclusions, as the illustrations do not give us an absolutely clear picture of what the Italian fioretto looked like. 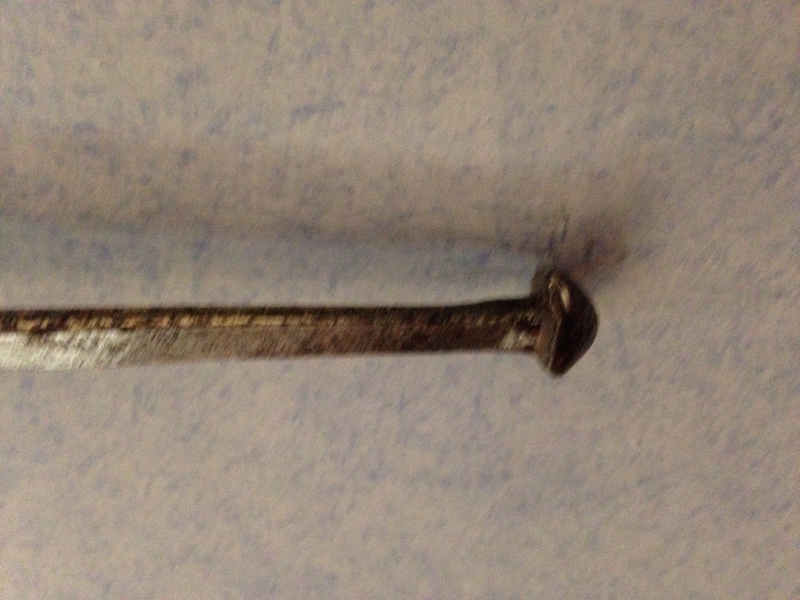 In this case we must rely on period artifacts found in museum collections. 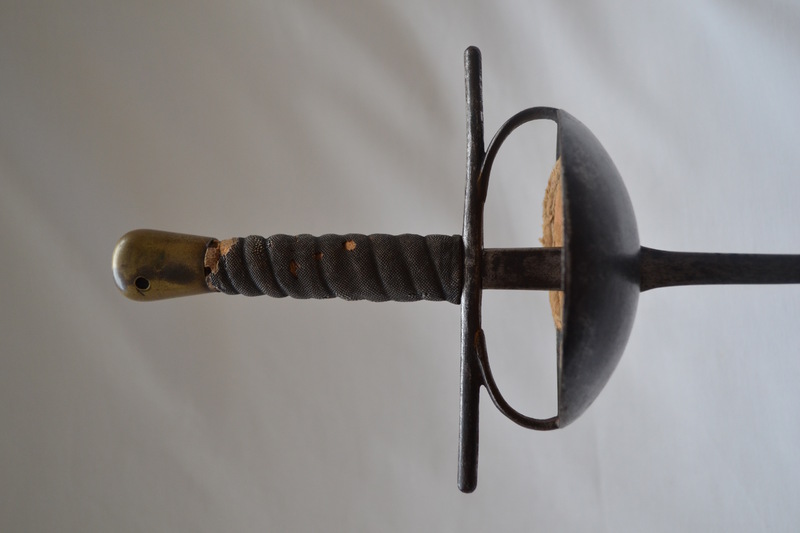 Therefore, we cannot pinpoint exactly when the cup-hilt became the standard hilt design for the Italian fioretto. A.V.B. Norman, in his book The Rapier and Small-Sword, 1460-1820 , indicates that the origin of the cup-hilt is Spain, and that one of the earliest known images of a cup-hilt rapier can be seen in a portrait of Philip IV by Velazquez in 1632. According to Ewart Oakeshott, in his book European Weapons and Armour , “this extremely practical hilt… did not come into use until the 1650s in Spain, and those parts of Europe dominated by Spain…” (p. 167). This included many parts of Italy and Sicily that were under Spanish dominion. 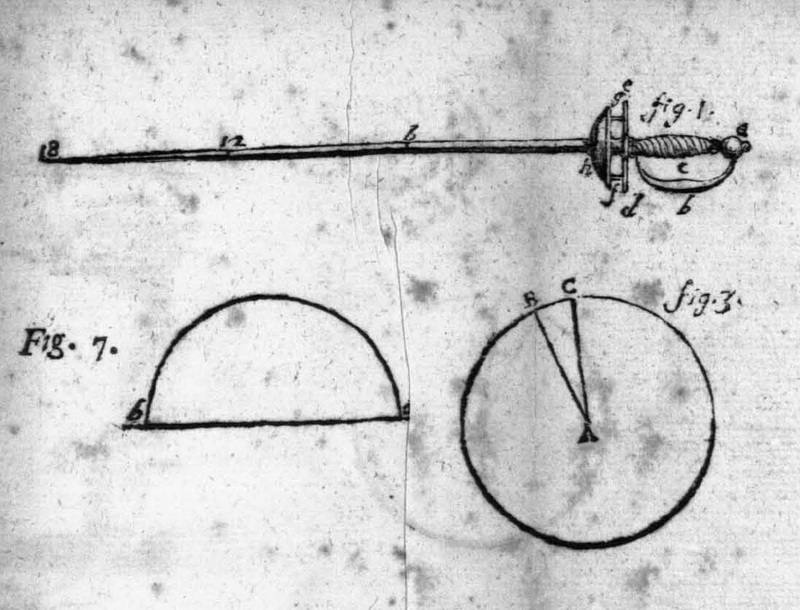 By the second half of the 17th century most Italian treatises, such as those by Giuseppe Villardita (1670), Francesco Antonio Marcelli (1686), and Bondi di Mazo (1696), have illustrations depicting fencers with cup-hilt rapiers. 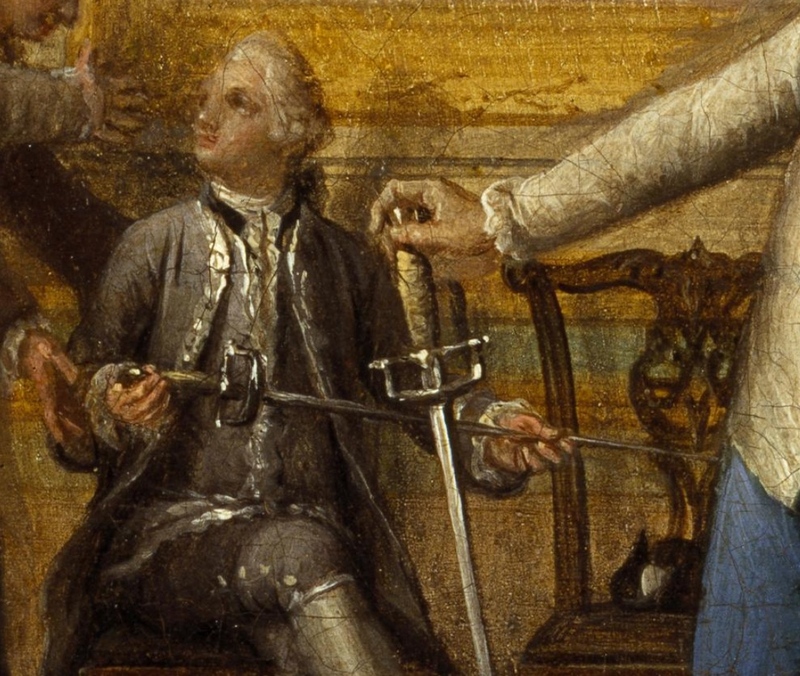 The treatises of the 18th century also show cup-hilt rapiers, such as Giuseppe D’Alessandro (1723) (see Figure 7) and Marco Marcello Vandoni (1750) (see Figure 8). 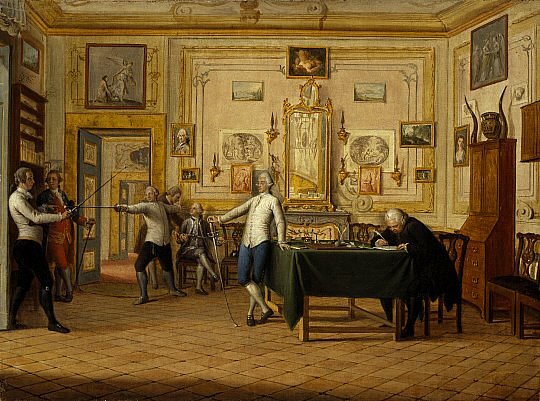 A painting by Pietro Fabris, 1771, in the Scottish National Portrait Gallery depicts a fencing scene in Naples, dating from the second half of the 18th century (see Figure 9). 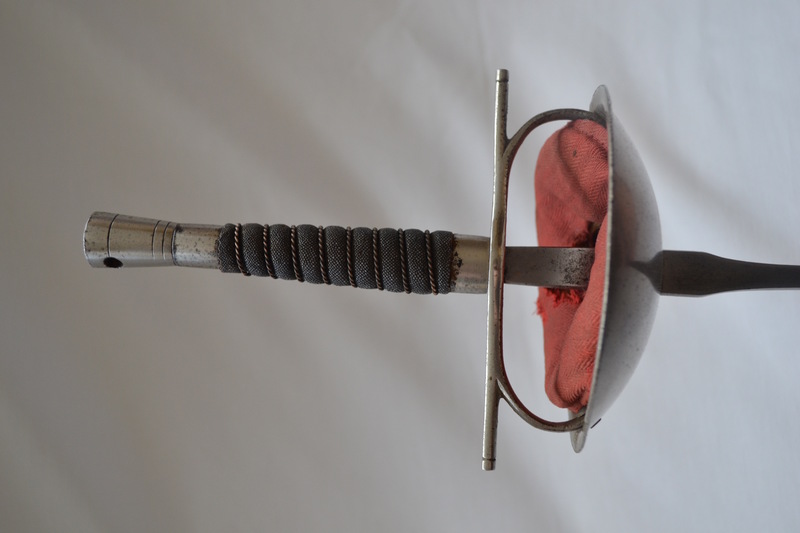 The fencers are using shallow cup-hilt foils with long blades. A close-up of a detail of the painting shows the type of foils being used (see Figure 10). 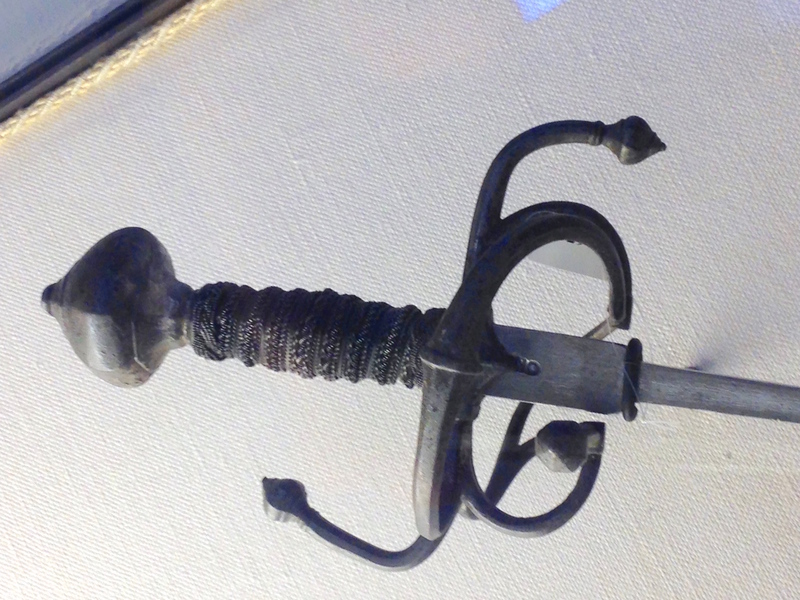 The Italian fioretto is, for all intents and purposes, a rapier. The blade is rectangular in its geometry as is the French fleuret; however, unlike the French blade, it retains its ricasso, which passes through the cup-guard. The hilt construction is based on the cup-hilt rapier. It consists of the cup, the arms, the crossbar, the grip, and the pommel. As in the cup-hilt rapier the ricasso part of the blade passes through the cup, the tang through the quillion block, the grip is then attached to the tang and the pommel affixed as a counterbalance. The manner of gripping the rapier with two fingers over the quillion directly resulted in the development of a shorter grip. There is, therefore, a direct correlation between the manner in which the sword was gripped, and the design of the hilt, which offered more protection for the sword hand. This also resulted in the shortening of the pommel, which allowed it to be gripped in the center of the heel of the palm of the hand, whereas with previous swept-hilt types, the pommel was larger, therefore held toward the edge of the sword hand, at a slight angle. 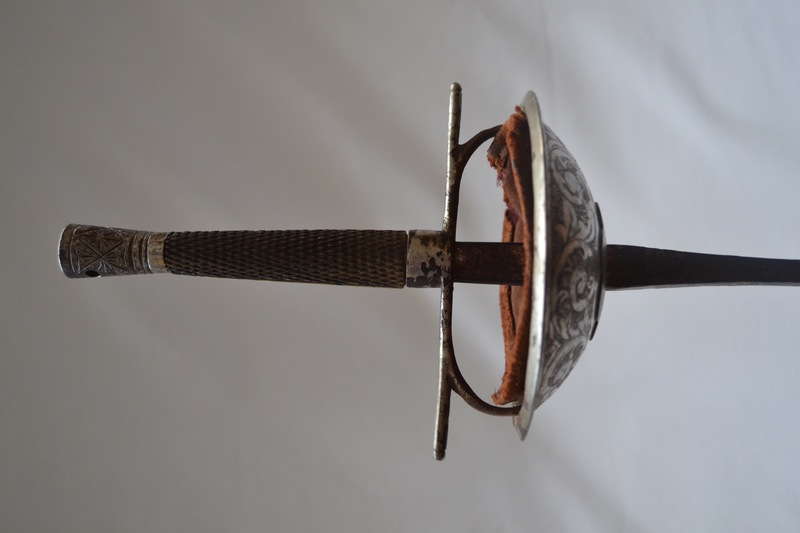 The cup-hilt foil design remained the standard for the Italian practice weapon; the width and depth of the cup varied, as well as the length of the quillions, which never excessively protruded beyond the circumference of the cup. The grips tend to be short (because of the previously stated reasons) and were constructed of wood that is checkered or covered with a variety of leathers and wire. The length of the blade also varied from guard to point (not counting the ricasso)—some of them could be a meter long, and some of them could be as short as thirty-two inches. Traditionally, Italian masters have recommended that the point of balance be from two to four fingers from the guard, which is exactly how Italian swordsmen have balanced their rapiers since the end of the 16th century. 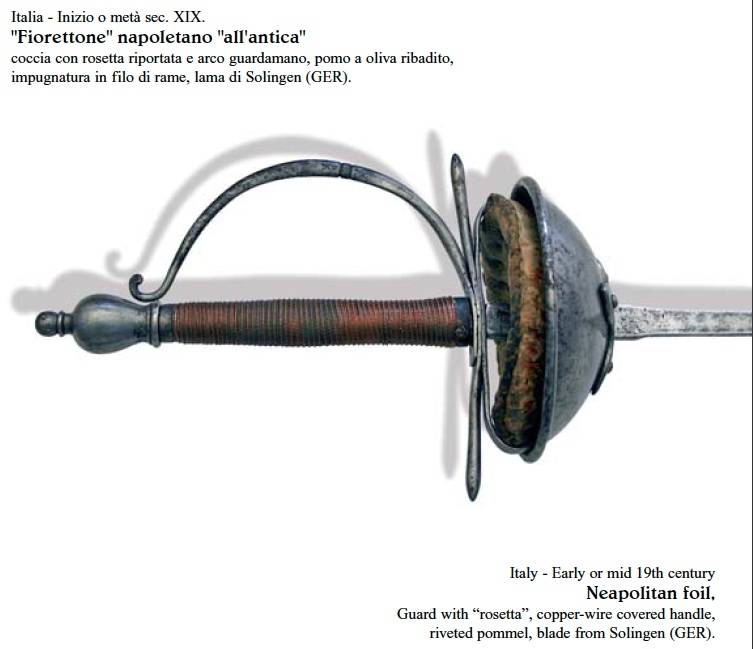 Some Italian foils also included a detachable knuckle-guard called an elsa, and when the foil was mounted with that elsa, it was known as a la spagnola (see Figure 15). * Puntellare or as some others say terziare is a verb used by fencers to describe the curve of the blade when pushed against a resisting target. A blade’s curve is puntellata when the curve happens in the first third or half of the blade. If the curve happens above the half the blade is less puntellata and vice versa. The custom of utilizing the smarra in training continued through the 19th century. However, by the last quarter, most masters abandoned this practice. Masaniello Parise, in a footnote on page 218 of his treatise, Trattato teorico-pratico della scherma di spada e sciabola (1884), mentions that, until recently, the smarra was a heavier type of foil used in training rather than the lighter one used in the assault (see Figures 17 and 18 for examples of Parise model foils, circa late 1800s and early 1900s). In the 19th century, there were two schools of thought. One was that the student practiced with a heavy smarra in the beginning, the idea being that this would make the fencer stronger, better preparing them to use the actual sword, which was in fact lighter than the smarra. 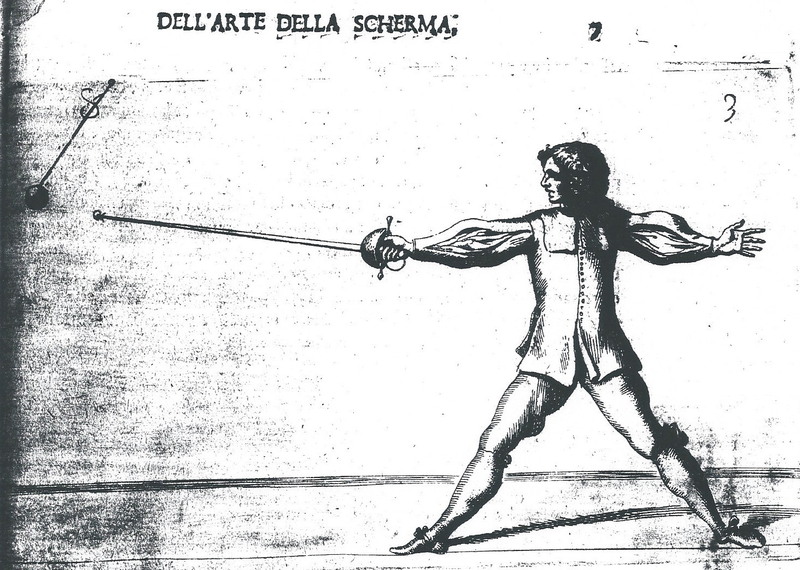 The other school of thought was to practice with the fioretto, because, although lighter than the actual sword, the fencer would be able to train for longer periods of time without undue fatigue, and that the arm and body would develop more naturally without the aid of what would today be considered a weight-training device. In my own master’s school, the Rohdes’s Academy, among his collection, there was a heavy Italian foil with a blade that weighed nearly twice as much as a regular blade, and was very stiff. But the length of the blade was exactly the same as the normal Italian foils that were used at the academy. Maitre Rohdes explained that this particular heavy Italian foil had once been used for a specialized type of training and was now obsolete. From the early practice rapiers of the 16th century through the 20th century, there have always been foils in the schools of arms. Specifically, they were made as training tools and the blades were meant to flex to varying degrees and buttoned to allow for safety in training. Florio, Blasco. La scienza della scherma. Catania, 1844. Scorza, Rosaroll and Grisetti, Pietro. La scienza della scherma. Milan, 1803. Guglielmo, Antonio. Sunto ed innovazioni sulla scherma di spada e di sciabola: sistema Napolitano, normale d’Italia. Messina, 1888. Please read Maestro Martinez’s blog on the proper method of gripping the Italian foil; Coming to Grips part I and II.